In the story Mark tells, Peter has just confessed Jesus to be the Messiah. Jesus then tells the disciples about his upcoming death and resurrection, and Peter, James, and John witness the transfiguration. The disciples are questioning each other about these enigmatic statements about death and resurrection, but they’re not comfortable questioning Jesus about this. The disciples are confused because if Jesus is the Messiah, and as such is ushering in 'the great and terrible day of the LORD,’ why do the scribes keep talking about Elijah coming first? Jesus answers enigmatically. Elijah is coming and has come. The text is true, but not in the way that its readers think it is. The disciples and most others expecting Elijah believed that he would be welcomed with open arms by God’s people, but instead, Jesus says, he is rejected. This is a foreshadowing of what will happen to the Messiah, the Son of Man. The New Testament primarily identifies John with the ‘voice in the wilderness’ of Isaiah 40. This is Jesus’ statement about him in Matthew 11:10 and John’s own testimony about himself in John 1:19-28 (the Gospel lesson for 3 Advent), where he says that he is not Elijah, but Isaiah’s voice in the wilderness. John’s own sense of who he was and who he wasn’t does not necessarily conflict with Jesus’ testimony about him as Elijah. John came before the Messiah preparing his way, as Elijah was expected to. However, John was rejected by those in power (much like Elijah was rejected by King Ahab and Queen Jezebel!) Jesus sees in John the fulfillment of the prophecy of Malachi. In this sense, Jesus may have seen more in John than John saw in himself. 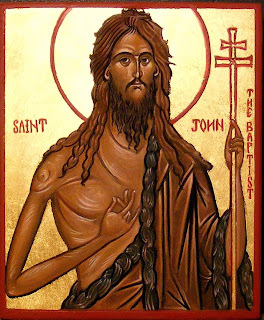 Does this mean that John the Baptist is Elijah reincarnated? I don’t think so. 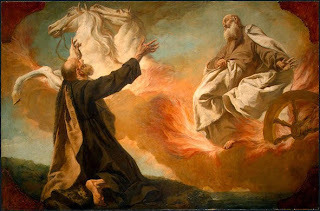 Rather, as Elijah’s mission was to turn the people from the Baals to God, so John the Baptist’s mission was to turn the people from sin to God. John’s mode of dress and behavior was characteristic of one of the earlier prophets such as Elijah. John fulfills the role of Elijah in seeking to turn the hearts of the people to God to welcome his Messiah. Some welcomed the message and were baptized – others rejected it. Elijah, John the Baptist, and Jesus suffered for their witness but were vindicated by God. There are a lot of weird answers to the question ‘was John the Baptist Elijah?’ on the Internet. Don’t just click on any old website. Instead, I recommend this one: blog.adw.org/2010/12/is-john-the-baptist-actually-elijah/. It features a more detailed explanation which is similar to this one, and as a bonus there is a nice arrangement of the Advent hymn On Jordan’s Banks the Baptist’s Cry set to the tune usually used by the Church of England.